I saw a bee on a flower. Will it sting me? Almost never. Why? Because bees generally sting only to protect the hive or if they feel threatened. Bees are normally not next to the hive while foraging for nectar and pollen, so their protection instinct is not present. All honey bees are usually gentle while foraging. If you leave them alone, they will leave you alone. How can our community benefit from having a Bee Garden? - Everyone can access the Bee Garden during park hours. - Everyone is welcome to come and learn about bees by reading signs and observing the hives. - Everyone can attend public demonstrations of the bees. - We work with local schools and teachers - offering field trips and pollination related curriculum. 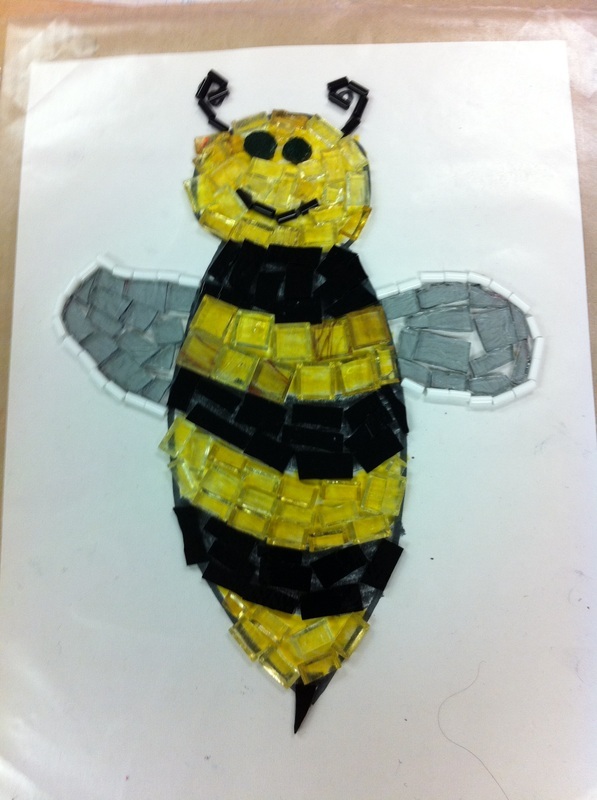 Elementary students created the mosaic near the garden entrance. - Helping the bees and helping people learn about bees is good for the environment and our food supply. - Honey bees pollinate 30% of all the food we eat and 80% of all fruits and vegetables. We need bees. Who takes care of the bees? Local volunteer beekeepers - the entire space is run primarily by volunteers. The idea for this project was posted on the West Seattle blog in early May 2012 and has received significant support from many West Seattle schools, organizations, local businesses and residents. Keeping bees is a great opportunity for High Point residents to host and participate in a well supported project and get to know neighbors. High Point has taken every precaution to ensure that the addition of beehives in the Commons Park P-Patch will be safe. This includes following safety standards set by King County, Seattle and the P-Patch Program. Beehives have existed for years in P-Patches throughout Seattle without causing any significant harm. Since we do plan to invite large groups to come see the bees, High Point is planning to incorporate safety precautions that exceed those already in place in some of the other Seattle P-Patch locations. By increasing pedestrian traffic in Commons Park, the bee project could improve safety in our neighborhood and would so decrease illegal activities. What safety precautions are you taking? The beehives are locked in an eight foot tall beehive enclosure with an open roof. This heightens the flight path of the bees and helps to minimize human/bee interaction. The enclosure also prevents vandalism or unruly behavior towards the hives which could be unsafe. Bees do sting when they feel their hive is threatened, but if left alone, are gentle insects. The enclosure also protects the safety of the bees. Only beekeepers approved by the HPNA Beekeeping Committee will be allowed to work with the beehives. What if I have an allergy to bees? Any person with an allergy to bee venom who is stung by a bee should call 911. Anyone with a bee allergy should have access to an Epi-Pen, and this should be used if they are stung by a bee. A First Aid Kit will be on site at the beehive enclosure and will contain instructions on steps to take if a bee sting occurs. Does this mean that there are going to be significantly more bees in our neighborhood? Not necessarily. Bees forage for nectar within a three mile radius of their hive. There are already many beehives within a three mile radius of High Point. The Seattle Department of Neighborhoods funded half of the cost of the P-Patch expansion, enclosure and additional structures. To qualify for the grant, significant support (via time, materials, skills and cash) was donated by neighbors and bee loving friends throughout the city. The High Point Neighborhood Association has also agreed to provide annual funds to cover the cost of maintaining the beehives and by hosting the West Seattle Bee Festival. The West Seattle Bee Garden has been the recipient of multiple West Seattle Garden Tour and Honeybee Conservancy grants. Thank you to everyone for your support! Please support the bee project and feel free to contact us!